MOSCOW, February 4. /TASS/. Media reports said on Monday that Russia had redeployed its new-generation Sukhoi Su-35S fighter jets (NATO reporting name: Flanker-E) to Syria. The Su-35S fighter jets started to accomplish combat missions at Khmeimim airbase in Syria last week, Russia’s Defense Ministry reported. The redeployment of advanced Su-35S warplanes to Russia’s Khmeimim airbase in Syria evoked the interest of both Russian press and some foreign media. Specifically, this event was mentioned by the German magazine Stern and the US media such as The National Interest and The Washington Times. 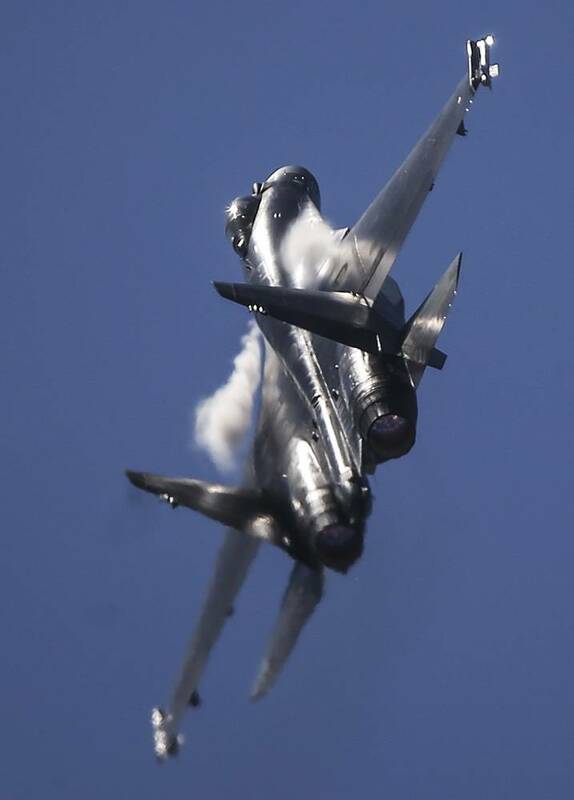 As Germany’s Stern noted, Russia’s Su-35S is considered as the most dangerous fighter jet in the world today, without taking into account the US fifth-generation warplane F-22. 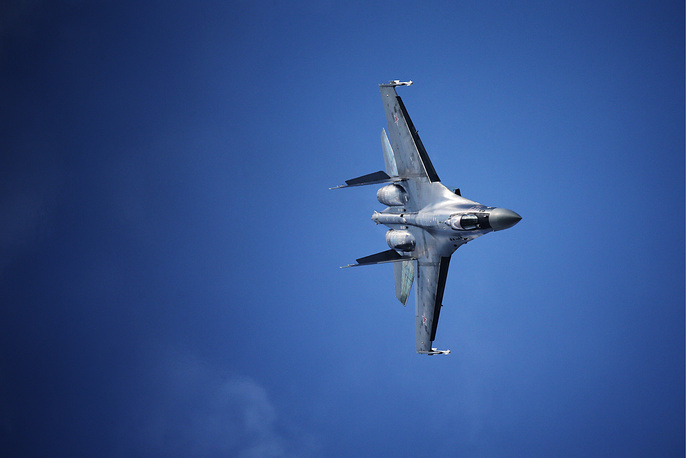 According to Stern, the Su-35S is characterized by its high maneuverability, is equipped with the newest Irbis radar and operates improved engines. The fighter jet features new-generation technology but at the same is relatively cheap compared to the most advanced western rivals. Stern expects the Su-35S fighter aircraft to fetch demand on the world armament market. Meanwhile, The National Interest reported that US defense officials were quite impressed with this latest Flanker variant. “It’s a great airplane and very dangerous, especially if they make a lot of them,” the international affairs magazine cited a senior US military official with extensive experience on fifth-generation fighters as saying. The US military official compared the Su-35 to the F-15 and F/A-18E/F warplanes, which “would both have their hands full” when encountering Russia’s advanced fighter jet. 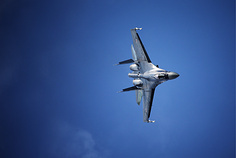 The advanced fighter jets Su-35 will be able both to prove their high performance in combat conditions in Syria and make their contribution to destroying militants’ ground objectives, former head of the Aerospace Force’s 4th center for the flight personnel combat use and re-training in Lipetsk Major-General Alexander Kharchevsky told TASS. The deployment of Russia’s advanced fighters in Syria also aims to test them in combat conditions, the general said. They “are very important from all points of view,” he noted. Russia’s multi-purpose supersonic super-maneuverable fighter jet Su-35S features the technology 4++. The warplane was developed in the 2000s by the Sukhoi design bureau on the basis of the frontline fighter jet Su-27 (Flanker). 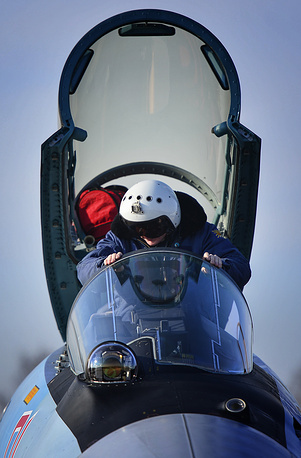 The Su-35 performed its first flight on February 19, 2008 and was operated by Russia’s merited test pilot Sergei Bogdan. The fighter jet has been serial-produced at the Gagarin Aviation Enterprise in Komsomolsk-on-Amur in the Russian Far East since 2011. 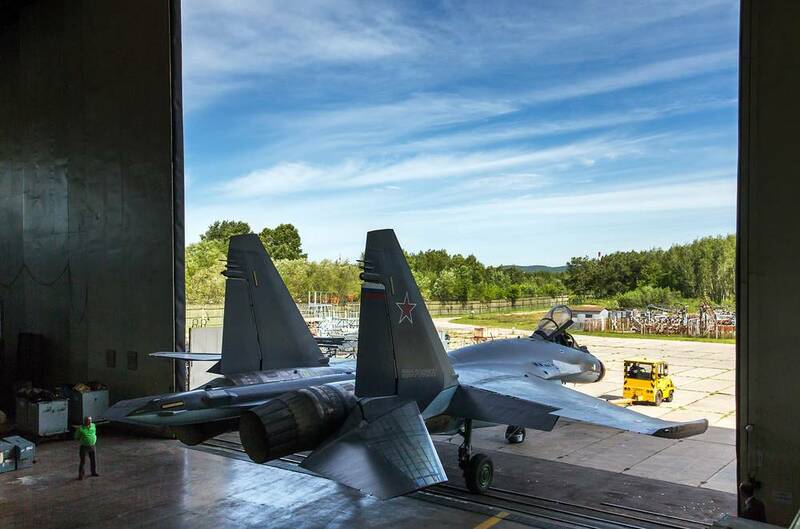 Russia’s state hi-tech corporation Rostec announced on November 19, 2015 it had signed a deal for the delivery of 24 Su-35 fighter jets to China, which would be the first foreign customer to buy these planes. By its aerodynamic design, the Su-35 is a two-engine high-wing aircraft with retractable tricycle-type landing gear and the nose gear strut. The Su-35 is equipped with AL-41F1S turbojet engines with an afterburner and a controlled thrust vector developed by Saturn research and production association in Rybinsk in the Yaroslav Region north of Moscow. 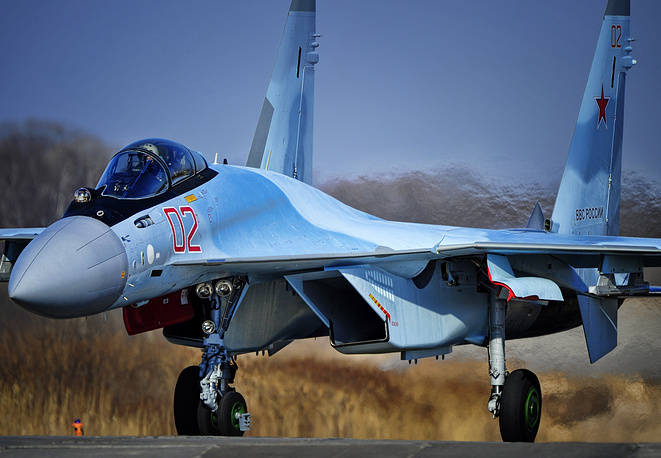 The 117S engine makes the Su-35 fighter jet a super-maneuverable plane. The engine was developed on the basis of its AL-31F predecessors mounted on Su-27 aircraft but features an increased thrust of 14.5 tons compared with the previous version’s 12.5 tons, better performance and reduced fuel consumption. The Su-35 fighter jet is 21.9 meters long and has a wing span of 14.75 meters and a height of 5.9 meters. The plane has a maximum takeoff weight of 34,500 kg, a maximum speed of 2,500 km/h and a maximum flying range of 3,600 km without external fuel tanks and 4,500 km with external fuel tanks. The fighter jet has a service ceiling of 20,000 meters. The crew consists of one pilot. The fighter jet’s service life assigned by its manufacturer is 6,000 hours or 30 years and the term of engine operation of 4,000 hours. The Su-35 has 12 external bays for precision missiles and air bombs and two bays for electronic warfare containers. 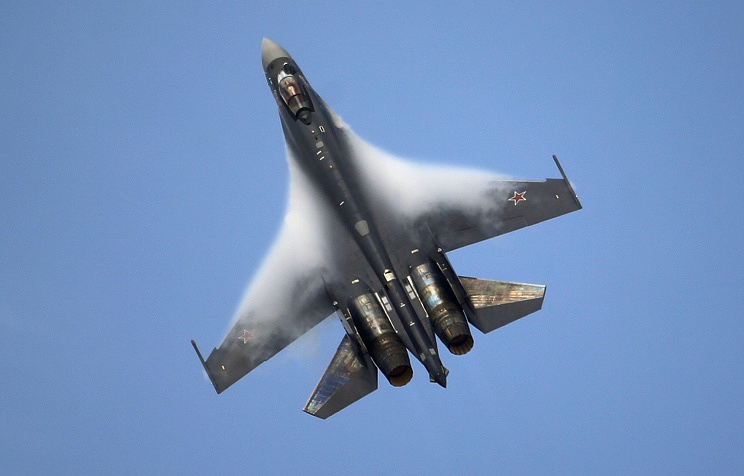 The Su-35 fighter jet is armed with a whole set of air-to-air and air-to-surface missiles, as well as with various-caliber rockets and air bombs. 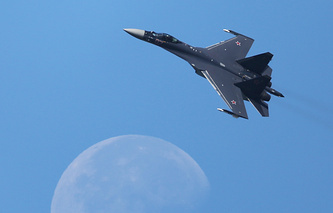 Generally, the Su-35 fighter aircraft does not differ from operational Su-30MK planes by its bomb and rocket weaponry but can eventually carry improved and new models of air bombs, including laser-guided bombs. The Su-35 fighter jet has a maximum combat load of 8,000 kilograms. 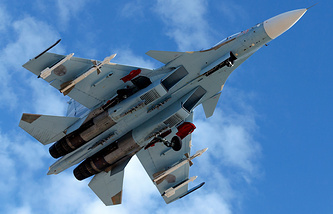 The Su-35 fighter jet is also armed with the GSh-30-1 30 mm gun with an ammunition load of 150 cartridges.